Chest-of-drawers from Marie-Antoinette’s private study at Versailles (The Wallace Collection, F247) and, below, an image of how it might have appeared when first delivered in 1780. The Riesener Research Project arose as a direct result of conservation work on one of the Wallace Collection’s finest pieces of furniture, a chest-of-drawers made for Marie-Antoinette. The work excited our interest in not only the materials and techniques employed by the royal cabinet-maker, but also in the subsequent changes that many of his pieces have undergone. Born in Gladbeck, Westphalia, Riesener emigrated to Paris like many German cabinet-makers at the time, making his fortune in the centre of the European luxury market. As accredited supplier to the French Court, his workshop delivered more than 700 pieces of furniture to the royal Garde-Meuble over the course of ten years. Exquisitely designed and ingeniously constructed, his creations were at the height of fashion during the late ancien régime and furnished many royal and aristocratic houses. 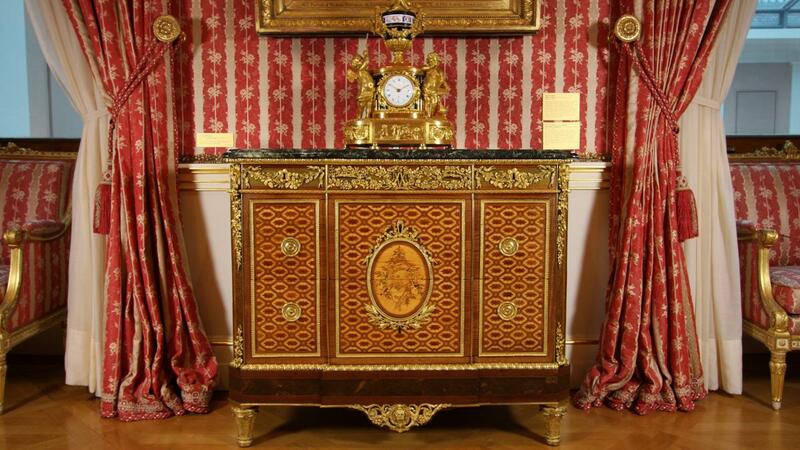 During the nineteenth century, the British developed a passion for Riesener furniture and today the Wallace Collection, the Royal Collection Trust and Waddesdon Manor hold arguably the most significant assembly of Riesener furniture worldwide, boasting 29 masterpieces from the cabinet-maker’s workshop. This comprehensive group of objects provides the starting point for what is the first major research project dedicated to Riesener and his workshop. Unlike previous research which has considered Riesener in the context of his patrons, this fundamentally object-based study focuses on him as a cabinet-maker. Considering the evidence of the pieces themselves, the aim is to analyse the techniques, methods and materials he used, and to investigate the way in which he ran his business so that he was able to fulfil the high number of commissions despite the limitations of a pre-industrial workshop. The leads of enquiry thrown up by this unique ‘bottom-up’ approach are rich and exciting and involve art historians, curators and conservators, as well as scientists and digital specialists. Through measured drawings, photographs and photogrammetry the precise construction of each piece is mapped and three-dimensional digital plans are modelled which allow us to construct and deconstruct virtually the furniture, without putting any stress on the physical object. Technical scientific analysis helps determine the precise composition of the materials. Together, these studies help us to follow the stylistic and constructional evolution of Riesener’s furniture, and to identify subsequent alterations, some of which may even have been carried out by Riesener himself. The project will culminate in print and digital outcomes, and an exhibition at the Wallace Collection.